Fujifilm Prescale® is a unique, affordable and easy to use tool that reveals the distribution and magnitude of pressure between any two contacting, mating or impacting surfaces. Pressure indicating sensor film is extremely thin (4 to 8 mils) which enables it to conform to curved surfaces. It is ideal for invasive intolerant environments and tight spaces not accessible to conventional electronic transducers. Fujifilm Prescale® is a mylar based film that contains a layer of tiny microcapsules. The application of force upon the film causes the microcapsules to rupture, producing an instantaneous and permanent high resolution "topographical" image of pressure variation across the contact area. Simply place Fujifilm Prescale® between any two surfaces that touch, mate or impact. Apply pressure, remove it and immediately the film reveals the pressure distribution profile that occurred between the two surfaces. 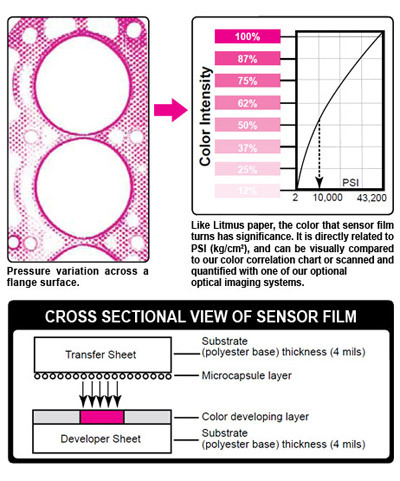 Like Litmus paper, the color intensity of the film is directly related to the amount of pressure applied to it. The greater the pressure, the more intense the color. Fujifilm Prescale® has a wide array of uses. For example, Fujifilm Prescale® can be used in a bolted joint interface, composite layup, heat sealing and lamination or press. Our pressure indicating film acts as a force sensing resistor. It can measure surface pressure distribution whether it is used as an impact force sensor, seat pressure sensor, as a strain gauge or even as nip impression paper. Refer to our applications menu for more detail on any of these uses of Fujifilm Prescale® for pressure measurement.